It is rare that an artist can transform a space such as the galleries at Tate Modern; rarer still to transform you, within it, into an entirely different state of mind; and even rarer to achieve these with purely 2D media. But Edvard Munch, along with the curators at Tate, has done just that. 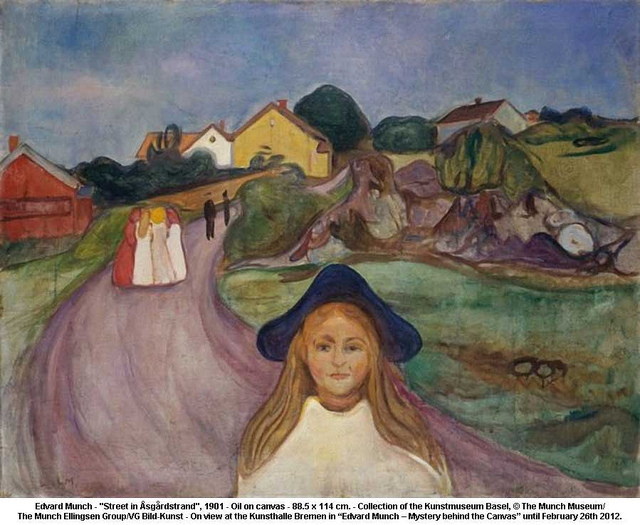 The new Munch retrospective opened last week, following the extremely opportune timing of The Scream 1893 auctioning, which propelled the painter to the forefront of current public interest. 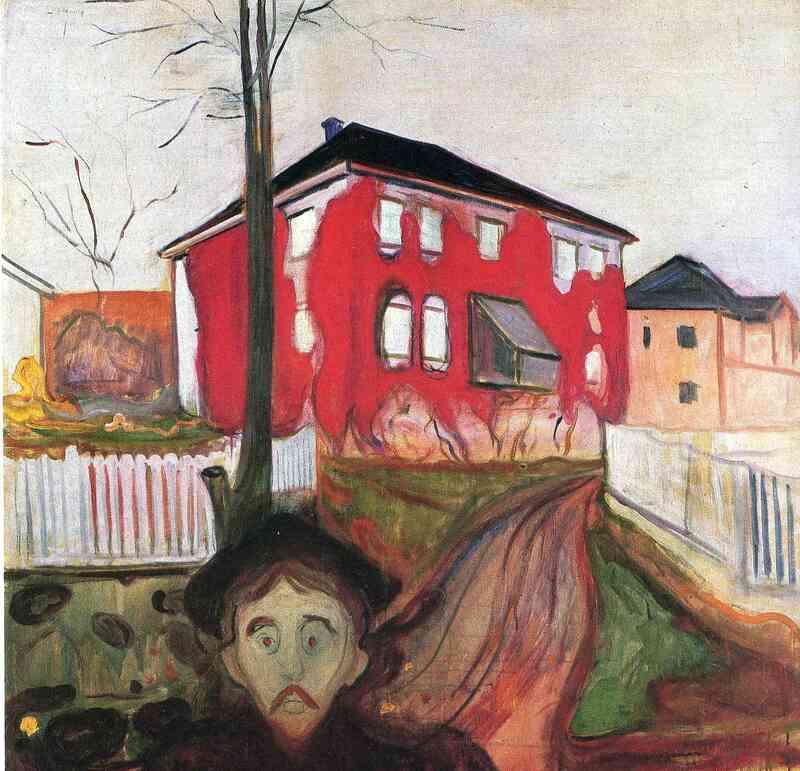 Not that Munch has ever really been forgotten; The Scream is endlessly parodied across all art forms. 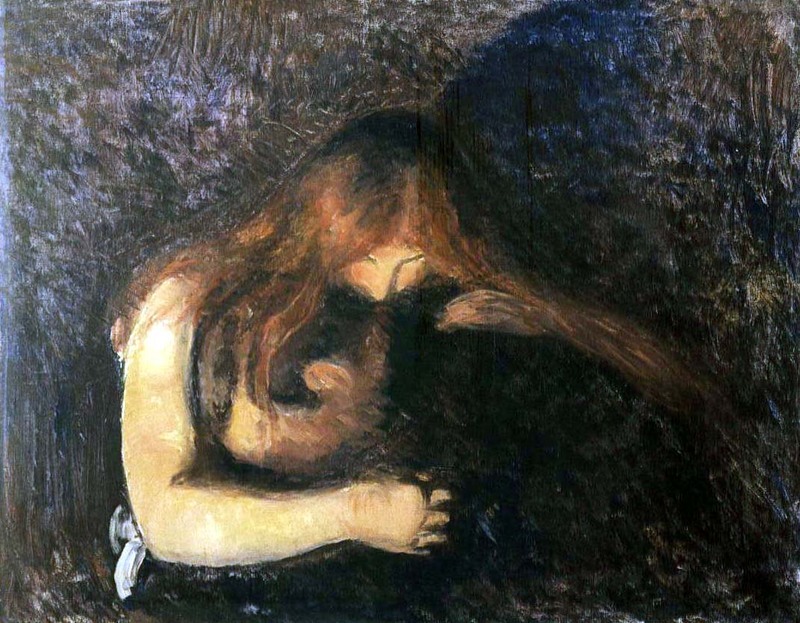 It is a shame though to think of the many disappointed faces when they realise that neither the scream is on show, nor the Madonna 1894-5, another classic Munch. 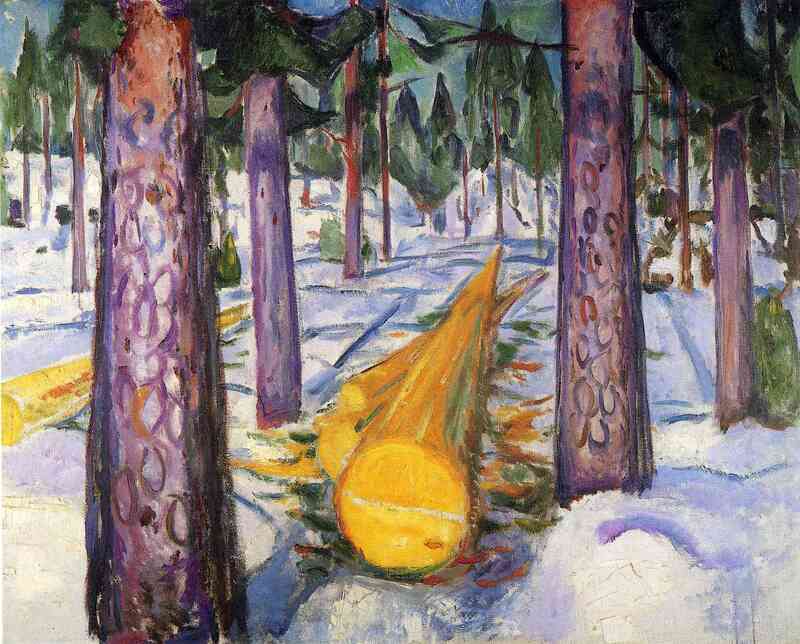 However I feel quite sure that any initial frozen smiles will soon melt to real furrowed brows of concentration and absorption as visitors get whisked away into Munch’s dreamlike world. Initially, in this William Blake-esque setting, where pronounced yet unstable verticals abound and focus refuses to submit to standard optics, you feel somewhat comfortable; as if a traveller in a pastoral narrative. Then you notice that the couple you spotted kissing tenderly is named Vampyr 1893-4, and the mother and child sharing an embrace is titled The Sick Child 1885-7. As if in a dream, comfort and menace intertwine; contrasting versions of works are displayed facing one another with you suspended in the middle, caught up in a fundamental struggle which permeates the rest of the paintings. One of the most fascinating elements of this show is the photographic experimentation and documentation of Munch’s interest in the new pioneering visual machines. Photography was relatively new at the time; Kodak had developed the first mass-marketed camera in 1901 – the Brownie. The sometimes transcendental effect of the photographs, created through over-exposure and double negatives, tied in with Munch’s own curiosity about spirituality as well as giving him an outlet for self-reflection. 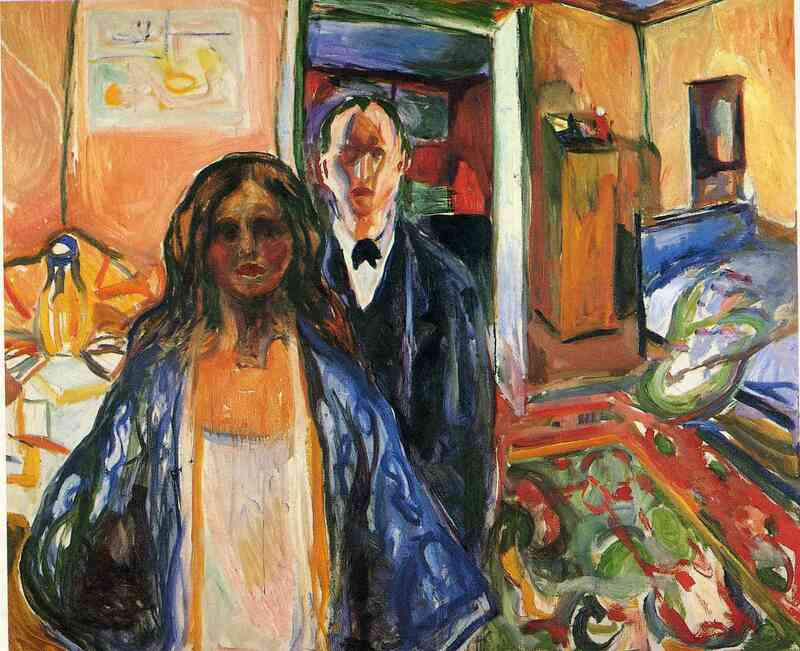 Munch dealt with an inner struggle, a fact which is well-documented due to his breakdown in later life, and threads of these issues do seem to shine through in his work. Looking through his photographs I felt a sudden concern that these images felt inherently personal. Much like the public/private battle of Gillian Wearing, I was torn between the fascination of voyeuristic intrigue and the moral inhibition around questions of personal privacy. Did Munch want these to be on show? Some show him in strange poses, and even naked; were they intended for public consumption or were they an intimate exploration of self? One theme which repeats throughout his paintings is that of the outward gaze. I call it a gaze, when what I really mean is a stare. Often threatening, sometimes unsettling, but usually menacing. Rarely does a figure smile at the viewer from the canvas. 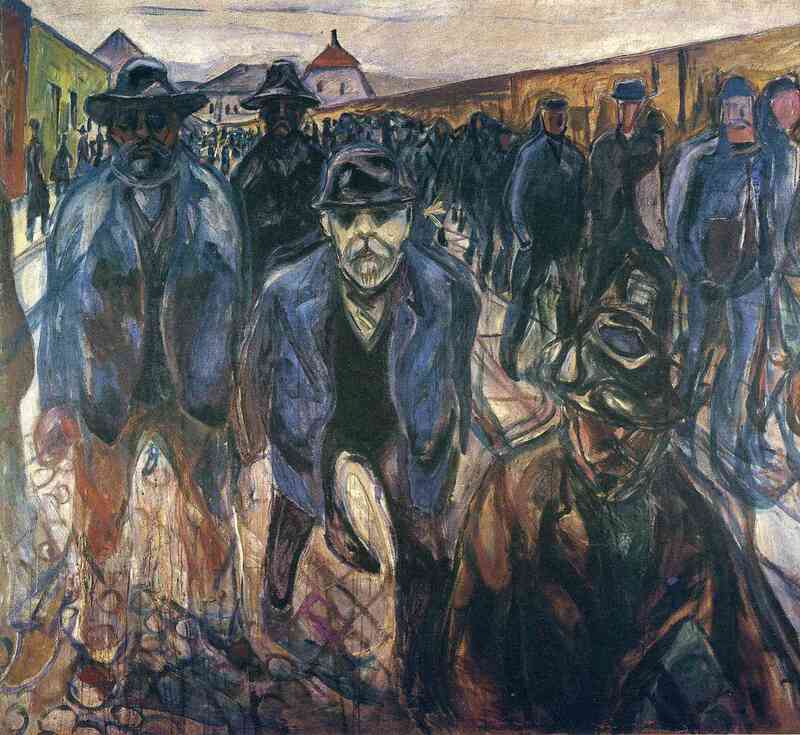 Paintings such as Workers on their way home ’13-14 portray frightening and aggressive stances towards the viewer. Was this how Munch saw the world? Are we the figure in the painting or is he? This motif continues in The Artist and his Model ’19-21, Murder on the Road ’19 and Red Virginia Creeper ’88-89 and creates an unsettling tension between viewer and painting. In Street in Asgardstrand ’01, the figure is there, albeit not so seemingly malevolent; but its very situation and directness still set the viewer on edge. 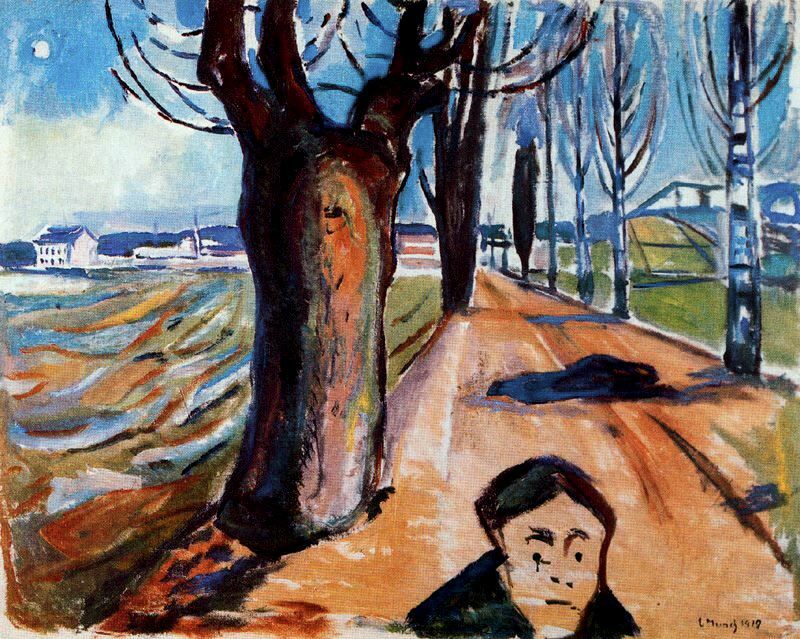 In the background, roads and pathways regularly appear, perhaps signifying ways to escape from his own state of mind. A group of people are often nearer to the path, but the solitary figure in the foreground remains, fixed and looking out from the frame; the way is there, but only in the peripheral. Throughout the exhibition I felt the overwhelming sense of an artist ahead of his time. 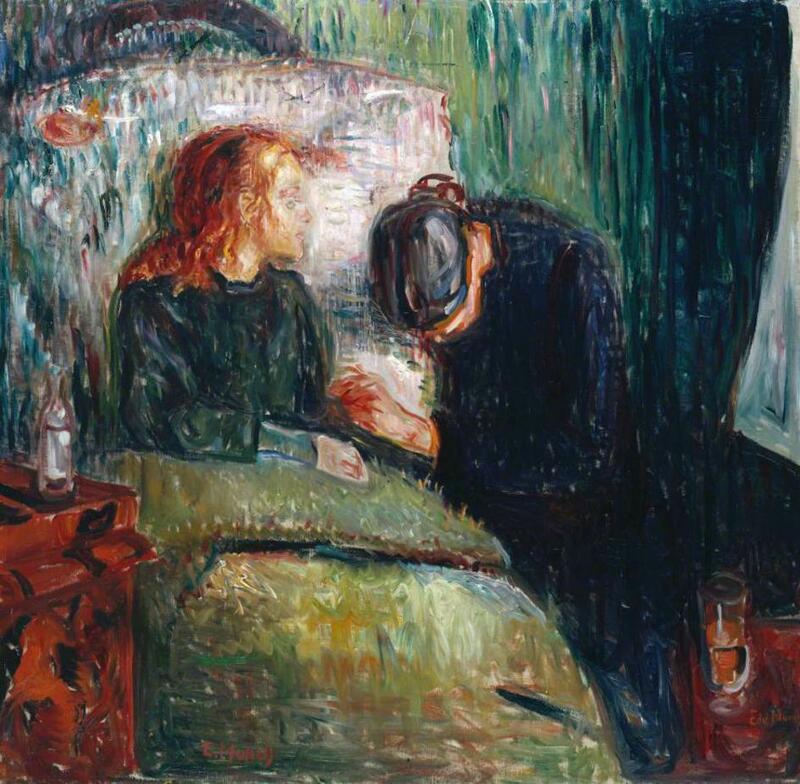 Despite the obvious influence of the Impressionist movement on his work, with its veritable myriad of conspicuous brushstrokes and deep variation of tone and colour, Munch’s ability to communicate tension through style and medium is sometimes reminiscent of very modern day artists. 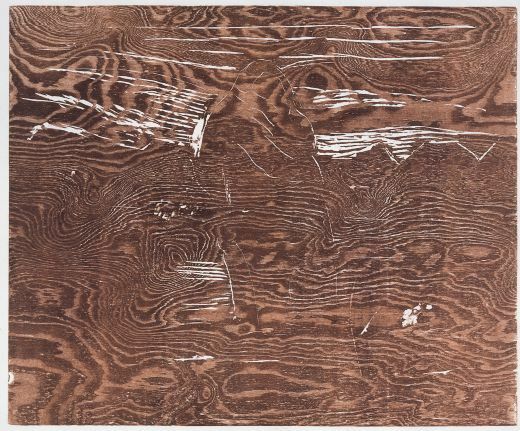 In Self-Portrait Facing Left ’12-13, he uses woodcutting to create a representation of self-image through a series of disconcertingly violent scratches. The composition of the piece I found reminiscent of Francis Bacon, creating form and raw emotion with fast movements. 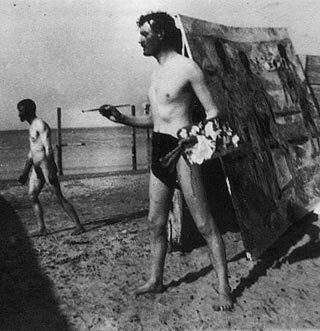 No wonder they named him an Expressionist. His Kiss in the Fields ’43 is intrinsically minimalist; the natural texture and grain of the wood contrasting against the sharp, imposed scoring of the suggested coupling. This piece could sit quite inconspicuously in a modern art gallery. Another of his pieces which could easily blend into not just a gallery, but a specific exhibition, is Yellow Log ’12. Anyone who saw the recent David Hockney exhibition at the Royal Academy could not fail to spot the extreme similarity between this motif and Hockney’s newer works; the comparisons are there in colour, form, style and technique. I hope that both Hockney and Bacon, as well as many other artists, would happily admit their debt to this great painter (Hockney for one could hardly deny it). His skill in conveying memories and emotions as almost lost in that moment between dream and wake; his ability to pick out the sharp points in those hazes, whilst still rendering the featureless forms in the background with inherent purpose. Towards the end of his life these nightmarish scenarios became reality for a period during his breakdown, in this period his paintings became less concerned with faceless shadows in the peripheral and more of a confrontation with solitary mortality. His work continues to fascinate us, and not just because he provides an insight into mental illness, but because we recognise his universal struggle with the human condition.